Biscotti are an easier to make cookie than I remembered - and surprisingly low fat. No butter or oil in these so no need to "swap-out" anything fattening for something less-so. They are quick to make the batter and even though it takes a double baking, they cook up quickly. So quick that you can make a few batches for your Holiday Cookie Swap. They store well and long and freeze well too. Great with coffee, tea, wine, and infinitely adaptable. All the things that The Bicycle-Chef loves in a recipe! Position a rack in the center of the oven and preheat the oven to 350 Degrees Fahrenheit. Line a baking sheet with parchment paper or a Silpat. Set aside. Mix the dry ingredients together in a large bowl -flour through the dried cherries. Stir well to combine. Whisk the eggs and vanilla together in a small bowl, then pour into the flour mixture. The dough will seem dry at this point but it will come together as it is kneaded. Turn the dough out onto a lightly floured work surface and knead, folding the dough over onto itself until it is smooth - about 3 minutes. Divide the dough into 2 or 3 pieces & shape each portion into a 10-12 inch long log. Gently press down on the logs to flatten them until they are about 2 inches wide and 1 inch high. Transfer the biscotti dough to the prepared baking tray. FIRST BAKING: Bake the logs for about 30 minutes or until they are slightly risen and firm to the touch. Slide the logs, parchment paper and all, off the baking sheet and onto a cooling rack. The logs must be completely cooled before you can continue on with the recipe. It will take about 30 minutes to cool. You can either turn the oven off or leave it on for the next step. You can bake the biscotti up this point and then do the 2nd bake several days later. If finishing the baking later, wrap the logs in plastic wrap, refrigerate and continue when it’s convenient. SECOND BAKING: When the logs have cooled completely, preheat the oven to 350 degrees Fahrenheit (if necessary). Line baking sheet(s) with parchment paper or Silpats. Working with a sharp serrated knife, cut the cooled logs diagonally into 1/4-inch thick slices. Place the sliced cookies cut side down onto the baking sheets and bake for 10-15 minutes or until the biscotti are crisp and golden. Cool on the pans. STORING: These biscotti will keep for up to a month in an air-tight tin or plastic container. Makes about 4 dozen mini Biscotti. 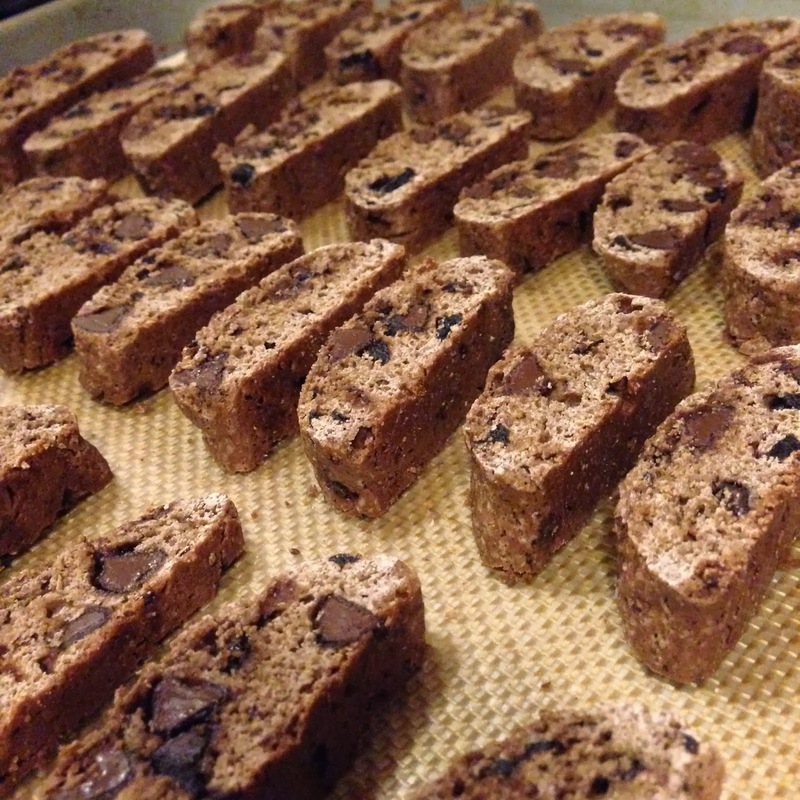 According to the recipe, these biscotti are actually called CANTUCCINI. They are in the vein of the classic biscotti recipe - using no butter or added fat, except what is contained in the eggs. They bake up exceptionally light and crunchy. You may be used to the crunchy texture of most biscotti, which is attained by baking the cookies twice. What you might be expecting is what isn’t there - the anise. With so many interpretations of biscotti, and the influence of other culinary flavors and trends, biscotti can be flavored endlessly. Add nuts, bits of dried fruit, extracts, liqueurs. The original version of this recipe called for whole unblanched almonds. Since the clementine cake is nearly all almonds, I omitted them and added in the chocolate and cherries. To make these biscotti even more enticing, dip the finished biscotti in melted chocolate and then dust with sanding sugars; sprinkles, or chopped nuts. Who says Holiday Desserts have to be fattening or bad for you? NOT ME! Our cake was gluten-free and the only added fat was from the nuts and eggs. These cookies are lower-fat and lower in sugar. Yet both desserts are rich, luxurious and wholly satisfying.